This topic contains 3 replies, has 4 voices, and was last updated by Darkest Star Games 1 year, 8 months ago. I’ve found myself bitten by the 6mm Sci-Fi bug once more, and can blame it squarely on the hours I’ve sunk into Titanfall 2. 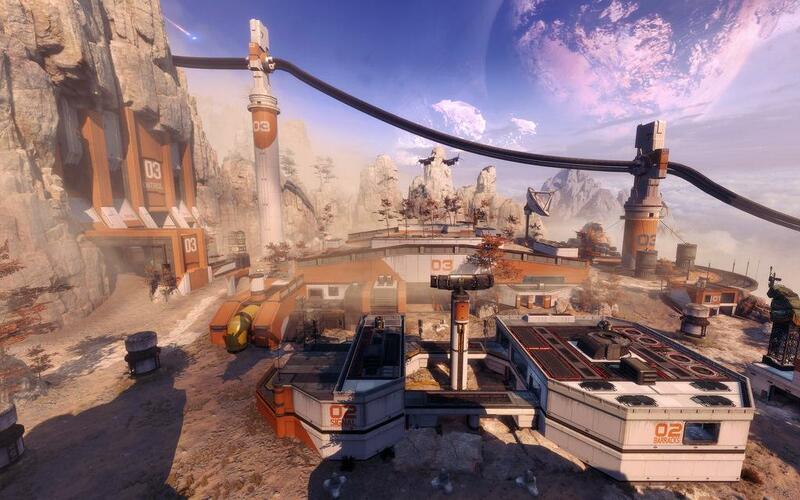 There’s a particular map that has tickled my fancy: Firebase Kodai. I particularly like the cylindrical concrete storage tanks, but the hard concrete edges of the outbuildings scream ‘sci-fi’ to me, without being all glass and technology. Does anyone know of an existing 6mm range, that fits the bill? Or perhaps know a manufacturer who would be willing to fill a gap? Nice picture Splod, I can’t think of any particular manufacturer for your needs of the top of my head, but a scavenge of your household recycle bin cleaning, washing products used containers, cardboard, foam-board and a trip to a hardware store will provide lots of the shapes your are looking for. True you will have to scratch build what you want but that’s part of the fun . Nice, I love the orange and white colour scheme. Might copy that, lots of inspirational stuff there. As for manufacturers, I’m the same as William. Nothing comes to mind, but it did scream scratch build to me. In 15mm it’d be easy (PLUS, Micropanzer has some mechs that are perfect for Titanfall!). Maybe Old Crow?